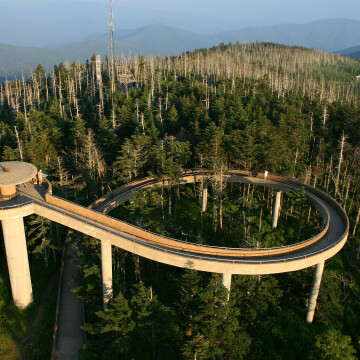 For a 360-degree view of the Great Smoky Mountains National Park, including Mt. LeConte and the foothills of Tennessee, a quick hike to Look Rock’s observation tower is all that’s required. Nestled in the Cherokee National Forest, minutes from Tellico Plains, Tennessee, is the Indian Boundary Recreation Area and Campground, 96 acres of swimming, fishing, hiking, biking, and camping. With its wide berth and modest incline, Schoolhouse Gap Trail is ideal for families and hikers of all ages. Located at the intersection of Laurel Creek and Spence Branch, it’s also a fun spot for water play and wading. For casual to experienced hikers, here are six ways to reach Tennessee’s highest mountain, depending on your starting points in either Tennessee or North Carolina. Five trails at Great Smoky Mountains National Park create this loop around and over Laurel Creek for a lengthy hike without steep elevation climbs. This is the first hiking trail visitors come to when entering the Great Smoky Mountains National Park from Townsend, Tennessee, which makes Chestnut Top Trail easily accessible to anyone looking to hike the western edge of the park.